> Dried Mushrooms>Black Trumpets>Dried Black Trumpets - 8 oz. 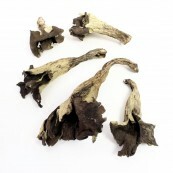 Dried Black Trumpets - 8 oz. 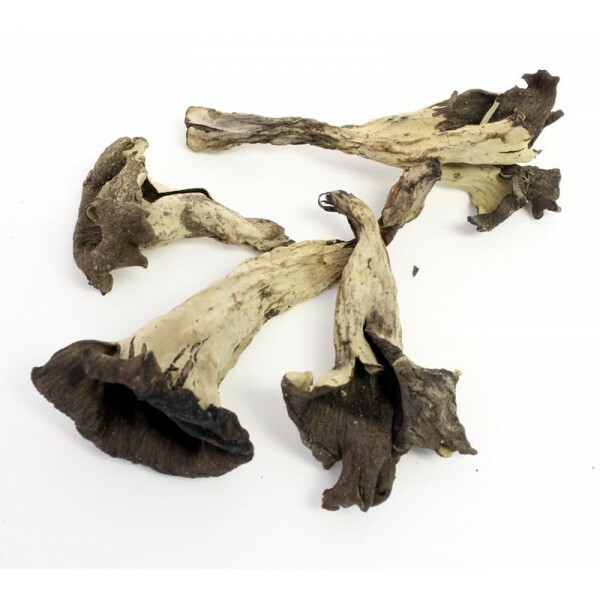 Black Trumpet mushroom elegantly known as Horn of Plenty is considered a great delicacy. They are wonderfully fragrant and have a potent woodsy flavor. Black Trumpet mushroom elegantly known as Horn of Plenty is considered a great delicacy. They are wonderfully fragrant and have a potent woodsy flavor. 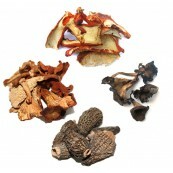 When dried this flavor is only but intensified giving the mushroom a buttery rich taste and pleasant fruity fragrance. Black Trumpets are great in vegetarian cooking because they add a richness and depth that is often the role of meat in a recipe. These mushrooms are delicious sautéed in olive oil or butter. This mushroom works well as a smoky flavoring ingredient in soups, sauces, pasta dishes and adds an interesting nuance to eggs, casseroles, fish and stir-fry dishes. Black Mushrooms are potential cancer-fighters. It contains a compound called lentinan, which is being used as a cancer treatment. 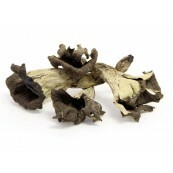 Black Mushrooms are also a good source of riboflavin and niacin and contain no fat or cholesterol. It is a good source of minerals, especially potassium and also a good source of vitamins, particularly B vitamins. Black Mushroom protein is also superior to many other vegetable proteins on account of its essential amino acid content.